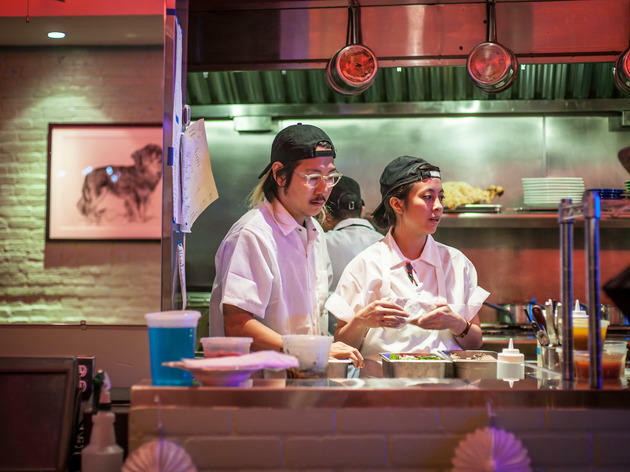 Like Michael Jordan in his prime, It chef Danny Bowien—who rocketed to culinary superstardom for his revelatory Szechuan at Mission Chinese Food—up and switched disciplines. 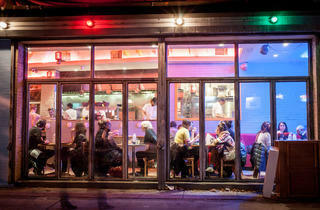 While Bowien’s got more talent for Mexican than MJ had for baseball, at Mission Cantina, he’s far from the top of his game. 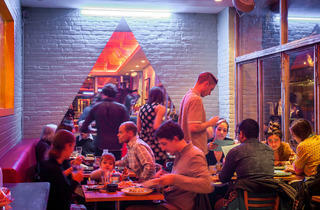 The haute-casual Latin dishes seldom mesmerize in the way we know Bowien can, and it’s not on account of any shortage of ambition: Most restaurants outsource their masa or tortillas, but this joint puts forth the herculean effort to stone grind and nixtamalize (braise in pickling lime) dried heirloom corn kernels into masa. It pays huge dividends in the form of intensely corny, delicately puffed tortillas. 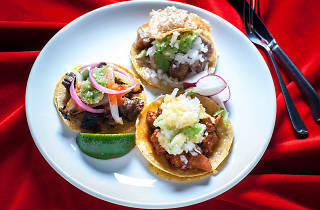 But the tacos themselves are hit or miss—that format is perhaps too confining to reflect Bowien's outsize creative endeavors. One boasts tender, deeply charred nuggets of pork cheek ($6.50), while another suffers from mealy, too-firm chunks of pumpkin ($6). Livery beef tongue ($6.50) is roused by pickled tomatoes, but a sleepy combo of braised octopus and grilled turkey wing ($6.50) is all texture, no flavor. The genre-bending stunners we’ve come to expect from Bowien exist beyond the taco template. 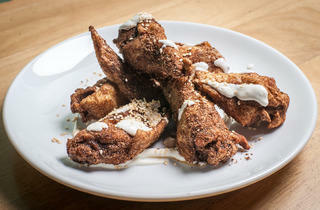 Crisp chicken wings ($12.50) smolder in a dry rub of mole spices, a balanced onslaught of smoky, spicy, bitter and sweet. Masa cooked à la grits tastes like corn to the infinity power, crowned by a thatch of braised collards tingling with hot sauce and beer ($8.50). 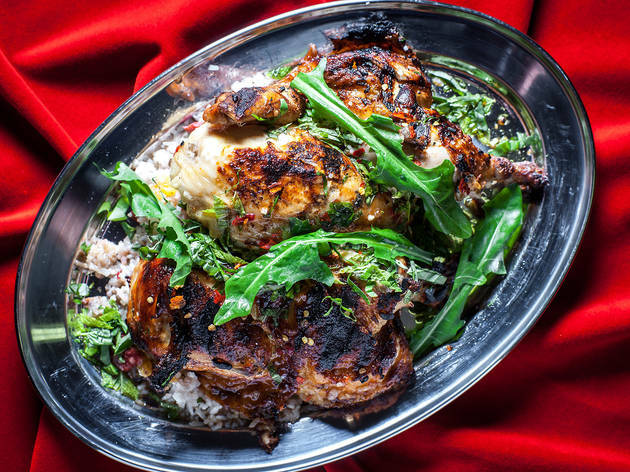 A whole rotisseried-then-grilled chicken ($34) has all the makings of a trademark dish, yet its juicy flesh is surprisingly bland, and its stuffing of rice, chorizo and raisins skews soft and sweet. The real signature is the new takeout burrito ($11), griddled crisp in chicken grease, and loaded with earthy red beans and luscious meats like grilled, fatty brisket. 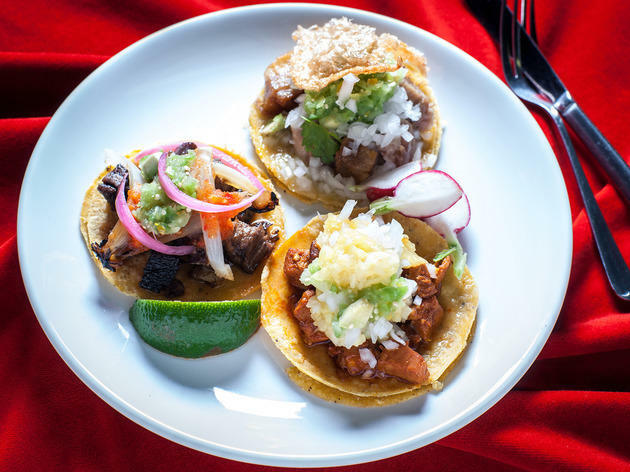 These golden, riceless torpedoes bust through the barrier between tasty and transcendent in a way that little else at Mission Cantina does. 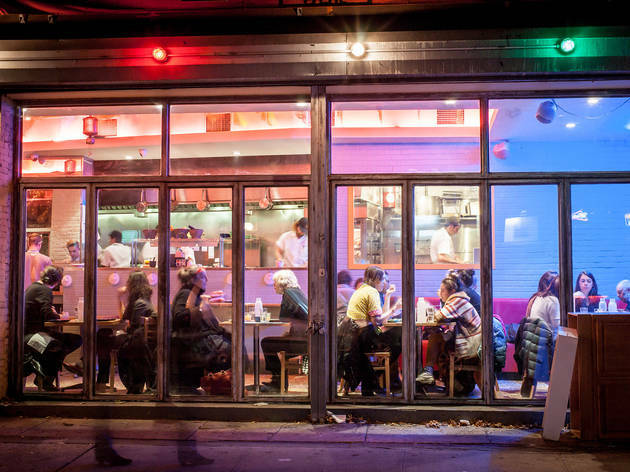 Where Bowien’s insurgent cooking at Mission Chinese Food launched a Szechuan reformation, his creative Mexican plates are merely a slight evolution. 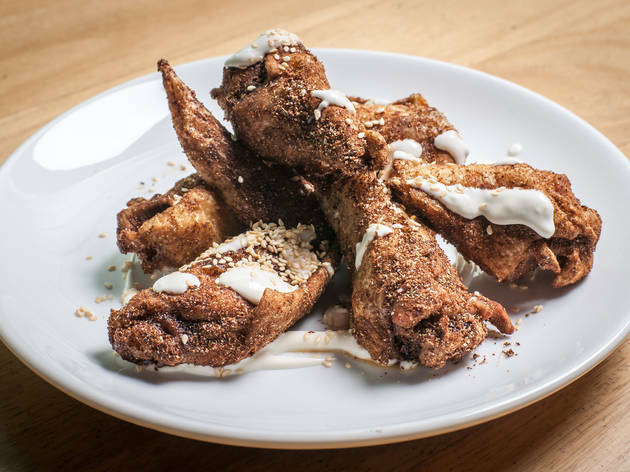 He brought his first restaurant to New York as a spin-off after years of experimentation in San Francisco, and his latest venture has had a much shorter incubation period. Sometimes a revolution takes time. Behind the bar: In absence of a full liquor license (and a stiff margarita), you’re better off with a throat-tingling michelada than any number of sweet cocktails scantly spiked with soju. Vibe: The compact room gets a psychedelic tinge from blue and pink neon and a giant triangular mirror reminiscent of The Dark Side of the Moon. Cocktail chatter: Bowien draws inspiration from all over, modeling tacos after Mexico City versions, burritos after those of SF’s late-night taquerias and the bar’s bamboo siding after NYC sushi joints. Soundcheck: With the stereo bumping and beer bottles clanking, it feels like a full-on party could break out at any moment. This place is awesome in theory. 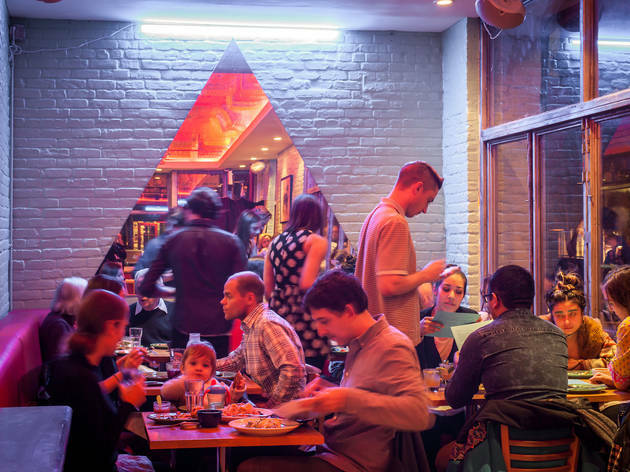 It's intentionally eclectic, located in a prime LES spot and is a blend of the best gluttonous foods--American Chinese and Tex Mex. 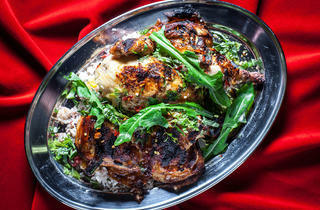 Plus, they bring out dishes as they're ready, encouraging shared plates and appropriate temperatures. In reality, it was pretty meh. I was starving when I met a friend there for dinner, so after one Modelo dinner should have floored me. Instead, the queso and quac proved to be a pretty strange blend of flavors, and the beef and broccoli was not good enough to overpower the absurdly loud music. While it's hard to ding them for it, this is definitely one of those restaurants where you are sitting in your neighbor's lap. All the fun triangular mirrors, chandeliers and mexican paper flags cannot overcome strain this puts on comfortable conversation. I'm going to go ahead and say they're trying too hard to be cool. In a city of truly excellent food, this is just okay. 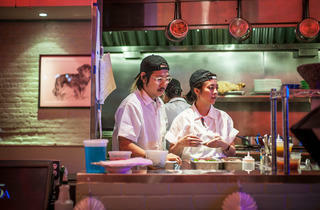 I continue to be not impressed with Danny Bowien's efforts. They used to sell tacos here and now they've changed to selling giant burritos with gut busting fillings. I'm running out of words to express how disappointed I am with Mission anything at this point. Pretty sure this place will not find its niche and footing for long time.